Philosophy Skin Care is a breath of fresh air for the beauty industry, offering simple answers to everyday skin care. The company proposes the idea that paying special attention to skin care can help in your search for personal happiness and fulfillment. It offers a lifestyle that celebrates the uniqueness of each individual. This product bridges the gap between cosmetics and dermatology, and caters to people of all ages and skin types. Cristina Carlino developed the Philosophy Skin Care products after investing decades into establishing and developing a wide range of products to assist in all aspects of beauty. Her first line of therapeutic skin care, Biomedic, was developed and distributed to plastic surgeons and dermatologists. This has allowed the company to maintain long-term relationships with the medical and scientific community. Philosophy made its debut in 1996, with several leading physicians and scientists still committed to the future development of the Philosophy product line. Philosophy skin care combines the benefits of over-the-counter skin creams with those that require a prescription, and offers all kinds of cosmetic options. The skin care line includes a variety of cleansers, masks, moisturizers, exfoliators and protection against the sun. Philosophy products help to address issues such as uneven skin tone, dark spots, large pores, loss of elasticity, and scaly patches. The line's featured products that have garnered the most attention are entitled 'Hope in a Jar', 'Hope and a Prayer', and 'Shelter'. 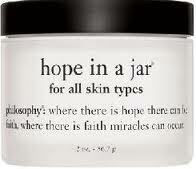 Hope in a Jar is all all-purpose moisturizer that addresses issues of dry and sensitive skin. This product fights against changes in the weather and ensures that your skin remains hydrated. The Hope and a Prayer product is ideal for those who may suffer with damaged skin cells. Shelter helps to prevents skin pigmentation and blemish. It acts as a sunscreen and protects your skin from UVA/UVB rays. Philosophy skin care also offers a line of exfoliate and peels. The exfoliators perform several functions that help to improve the condition of your skin. They help to reduce the appearance of fine line, deep clean pores, and enhance the creams and makeup that you currently use. Anyone can use theses exfoliators, whether they have oily, combination, dry or mature skin. The oxygen peels help to exfoliate your skin as well, resulting in a radiant glow. The peels hydrate your skin and help to smooth out fine lines. It is soothing and aids with blocked, large pores, and is a long-standing favorite amongst Philosophy customers. Both the exfoliators and the peels act to create a skin rejuvenation process. Although this company does cater to dermatological skin issues, it does not forget the lighter sides of beauty enhancement. The Philosophy brand includes a full range of beauty products. It also offers makeup, fragrances and body treatments. "If there is hope, there can be faith, where there is faith, miracles can happen." This inspirational message follows its products as Philosophy skin care takes a different approach to branding. The very simplicity of Philosophy's products, ingredients and marketing make it appealing to customers disappointed with the hype with which other brands are associated. Labels are very subtle, most packaging using black on white approach with no capital letters. 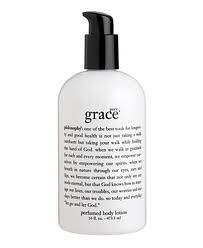 The names of the different products may stir memories of a church hymnal with a line called "amazing grace", or you may lick your lips over titles like "cherry angel food cake shower gel" and "pineapple coconut lip shine". All of these elements combine to create a relaxed yet sophisticated feel. Obviously, this technique and others has proven to be attractive qualities. This product line has no shortage of supporters. Celebrities such as Amy Grant and Oprah Winfrey are fans of the company. There are times, when you may need quick answers to your skin dilemmas, and Philosophy Skin Care offers simple solutions to everyday skin care. Perhaps you may want the convenience of a retail store's product but the efficiency of a dermatologist. The Philosophy products connect cosmetics and dermatology, and cater to people of every age and skin type. Ultimately, Philosophy has what we all want, the advantages of the over the counter skin creams combined with prescription quality and results.